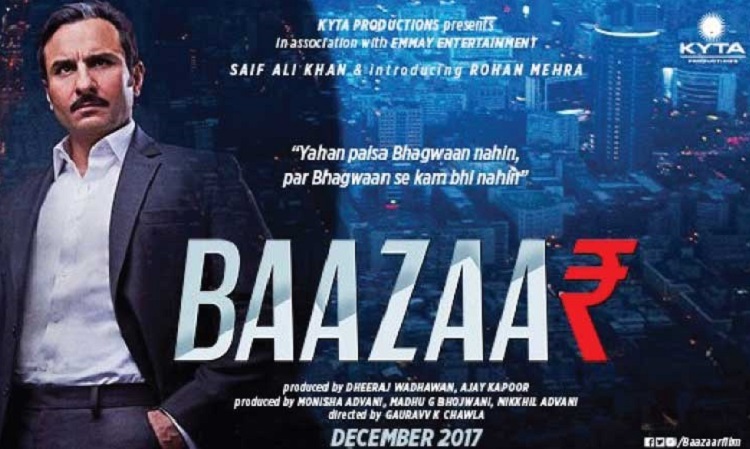 The wait for Saif Ali Khan's fans is finally over as Nikkhil Advani's directorial 'Baazaar' is geared up with the trailer. The first look of the posters and trailer is finally out! The film stars Saif Ali Khan along with Radhika Apte and Chitrangada. The film narrates the story of Rizwan Ahmed (Rohan Mehra) who aspires to bypass Saif's character, Shakun Kothari. The race for the top place with a twisting tale of the two characters is brought to life by Chitrangada. While the film's poster features Saif besuited with a moustache, his crisp and fresh character have caught the audience's eyes. According to the reports of TOI, his character will be seen as a banker in the film as he can be seen sitting on a chair with background indicating stockmarket. While the poster's quote reads "Bada aadmi Banna hai, toh line cross karni hogi" which gives a glimpse of his life mantra. The film also stars Radhika Apte who can be seen standing near the reflection of stock market numbers. The quote on her character's poster reads "Lottery Jeetne Ke Liye Ticket Lena Padta Hai". Lastly, Chitrangada Singh who will be seen as a perfect wife and mother is admired and envied, but does money buy happiness. She can be seen enjoying the fine dining experience, as her poster quotes, "Yahan Paisa Bhagwan Nahi Par Bhagwan Se Kam Bhi Nahi".